I’m sure the anticipation has been driving you batty! Wait no more. 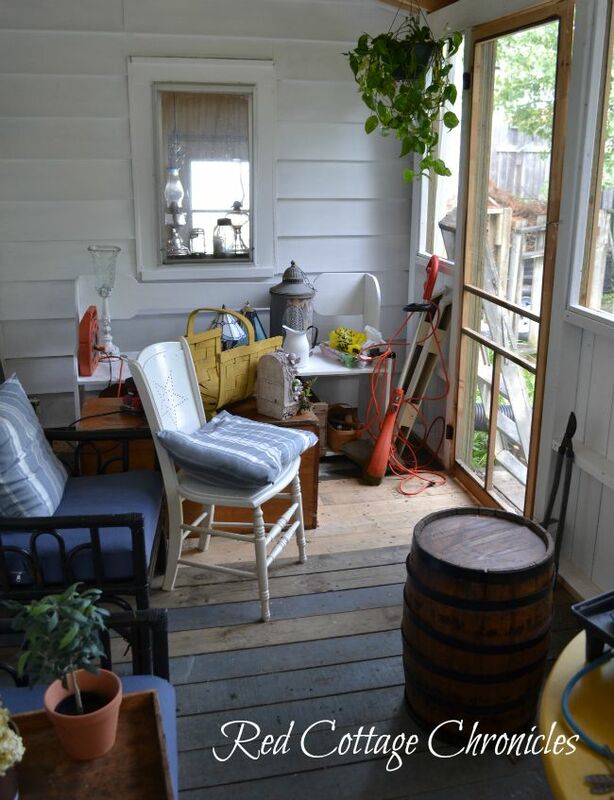 Leslie’s screen porch reveal is finally here! The build itself went really quickly. It was the waiting for the weather to cooperate. We were given strict orders when we bought the paint not to paint when it was too hot. And of course that is when the humidity kicked into high gear. Lots of hours and hard work went into this project, but I think you will agree it was well worth it! You can see all the before pictures here. And the progress as Tim was finishing the build here. And, after it had been demolished and re-built. I will be posting the outside reveal next week. Still a bit of staining and landscaping to complete! Here is how it looked when I arrived today to get things looking pretty. All the walls have been painted white, which really brightens up the room. There are few things that we will finish in the spring, such as painting the floor and ceiling. Leslie has to decide on colours. But, with fall so close I really wanted her to be able to get back to enjoying the relaxing space. Without further adieu here is a look at the (inside) after pictures! The only thing we spent money on for the inside was curtains from Ikea. We still have one set we haven’t hung yet, but Leslie’s yard is quite private and but we are leaning towards hanging them, but leaving them wide open. 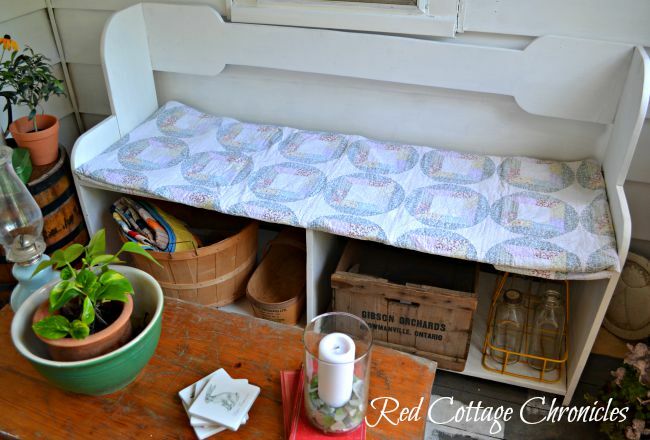 This will soften the corners without spoiling the breeze or the view. This cane stool is actually quite comfortable, and adds one more place to sit, or swing it around in front of a chair and put your feet up. 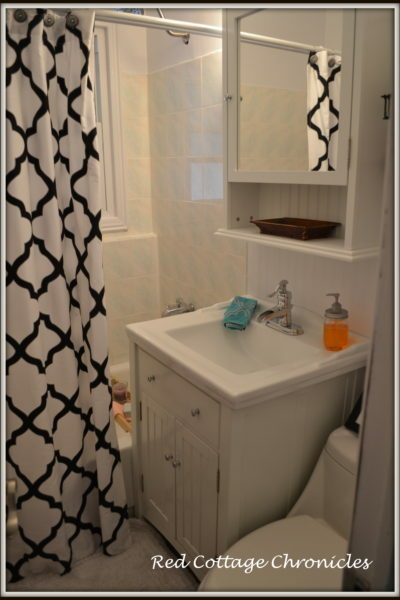 You might remember from Leslie’s bathroom reveal that she has a lot of “stuff”. She likes old and rustic pieces and it was easy to “shop” her house to make it a style uniquely hers. 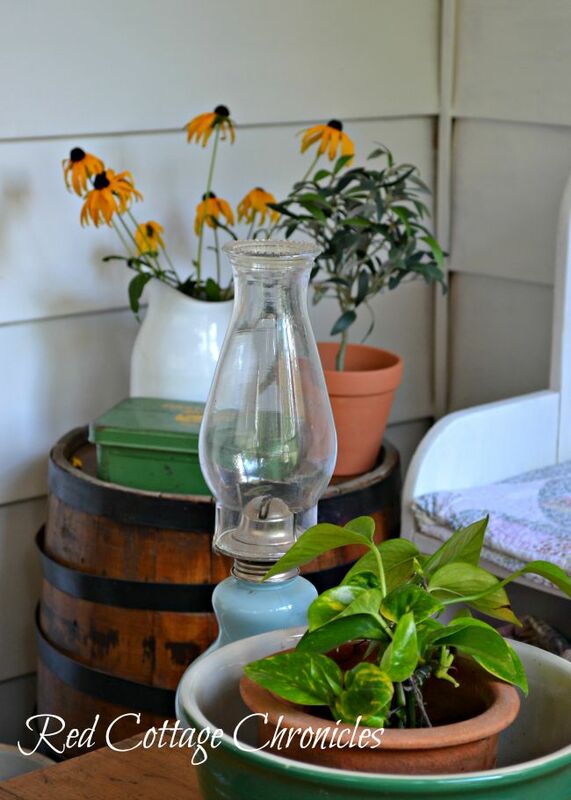 I don’t know about you, but I don’t have a really old wine barrel tucked away ready to turn into a little side table! 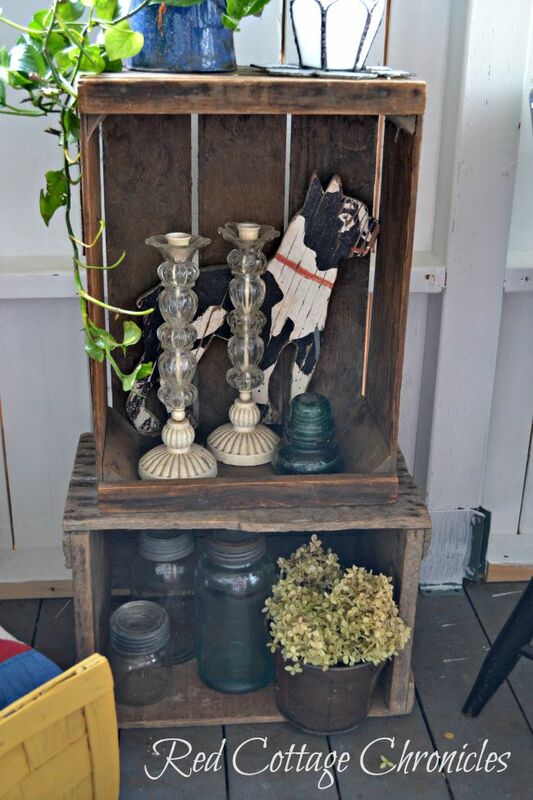 I had lots of old crates to choose from, and ball jars. A telephone in just the right colour, of course! Yup. She has vintage lab test tubes! 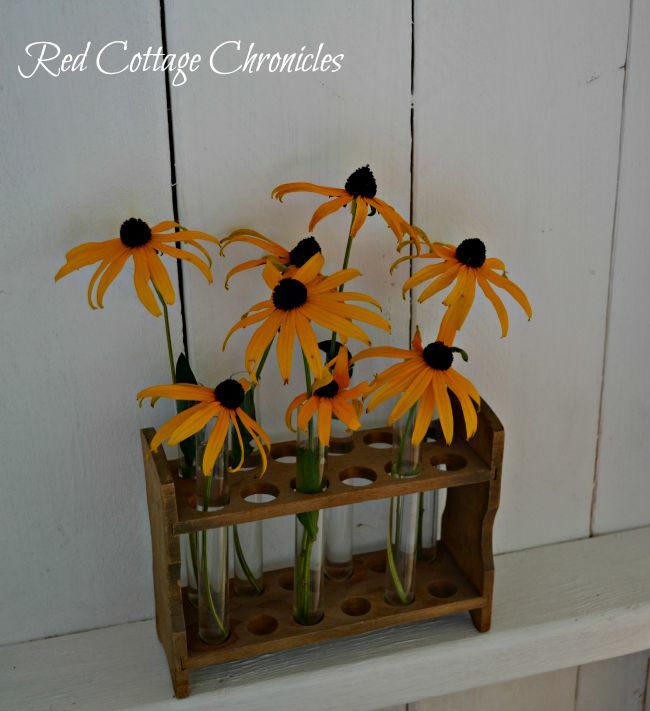 Perfect for some single Black Eyed Susan blooms. The old checkered board looks great on the wall, and can be turned around to display the crokinole board on the other side. A few more flowers from my garden complete the enamel coffee pot. This print was one I had picked up for Leslie from The Lettered Cottage a few years ago. Her beautiful (and very large) dog is named Hank so I couldn’t resist. 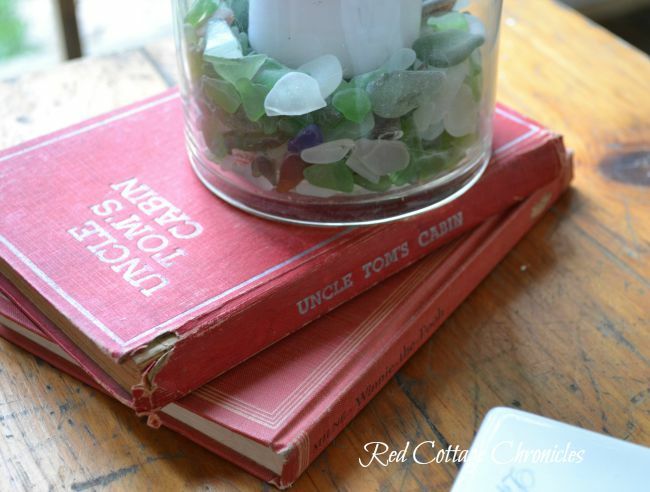 And of course, just like the bathroom project, I couldn’t have found a better book in her collection to be displayed here in her rustic cabin-like screen porch. I put most of this room décor together with Leslie not at home. I knew I couldn’t go wrong since everything in there is from her home. I am pleased to report that she loves it! So what do you think? I am sure those of you who are visiting the blog today who know Leslie will agree that this is totally her style. 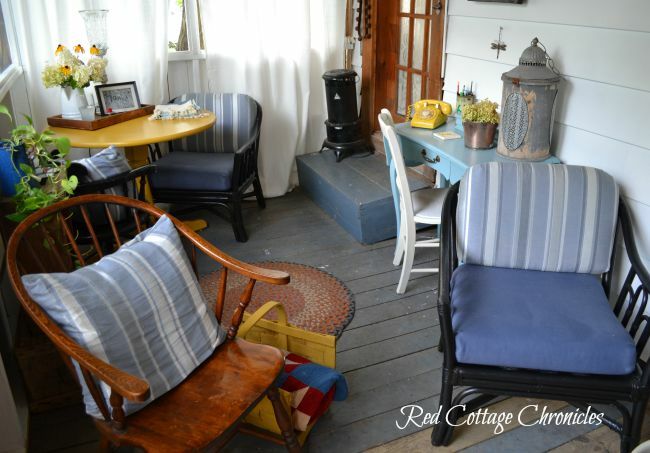 I did shoot a little video tour of the finished space, but since videos are new to me, you will have to follow Red Cottage chronicles on Facebook where I will post it when I figure out how to edit the darn thing! A huge thank-you to my amazing husband Tim and my hardworking brother Steven for the renovation work! And, to Marlie for putting her muscle into getting the screws in the wall so I could hang things up! Lets be friends! 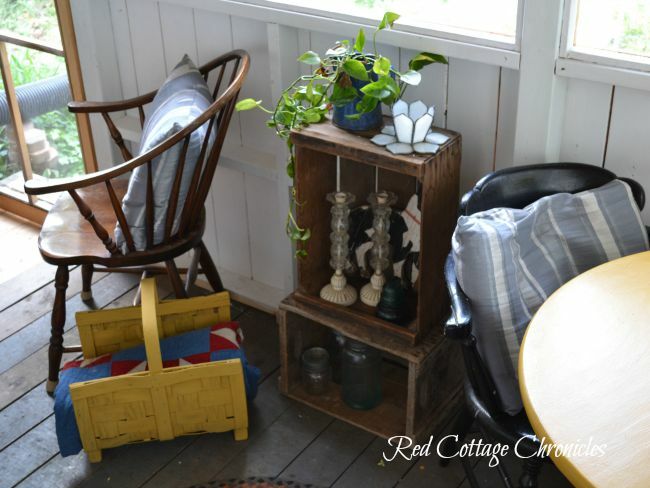 Subscribe and stay in touch with the happenings at the Red Cottage! Fantastic job! I actually thought the floor was done like that intentionally (ie pathway to the door with the ‘unfinished’ boards and ‘striping’ for visual interest). Very welcoming porch to ‘sit a spell’! You’re a great friend to use your know-how to create this cozy space for your friend. I imagine you’ll spend many hours there with her, chatting about life. Thank-you to you and Leslie for sharing this with us! Thank you so very much Jan! I was thinking the same about the license plate! I will have a close look and see what I can figure out. I am so happy I have this “talent” to share! Thanks Leilani! You know you are welcome any time! Very well done! It looks so inviting and cozy – a perfect place to relax and enjoy the end of Summer and the arrival of Fall! 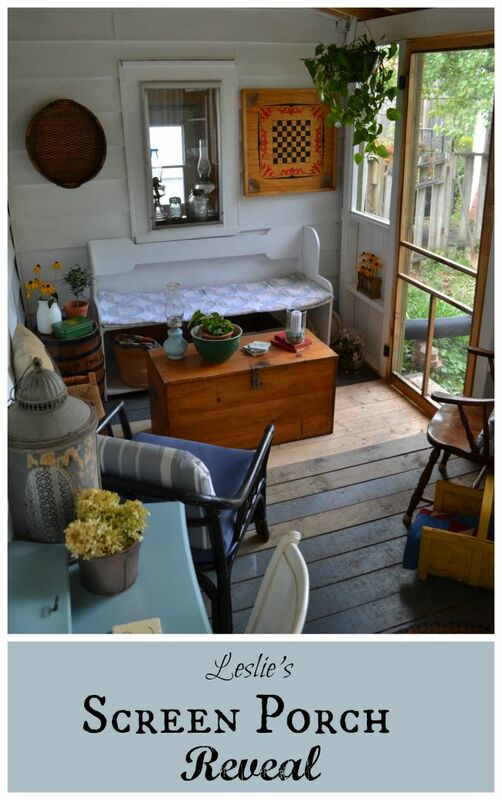 Wonderful transformation and I actually love the floors unpainted. It’s great that you “shopped” Leslie’s home to be able to put together the decor for the porch too. She has some lovely things. Wow, it’s gorgeous! I bet you love to sit out there! Looks like a super comfy-home-y place to relax. You have great taste to put it all together like that! Oh wow, that’s a huge change! Looks like such a cozy place to sit and read a good book! I too like the floor as is – so rustic! This room is a great place to have coffee with a friend, comfy and personalized. Nice job. I think adding the curtains will make it even more inviting. BEAUTIFUL!!!! 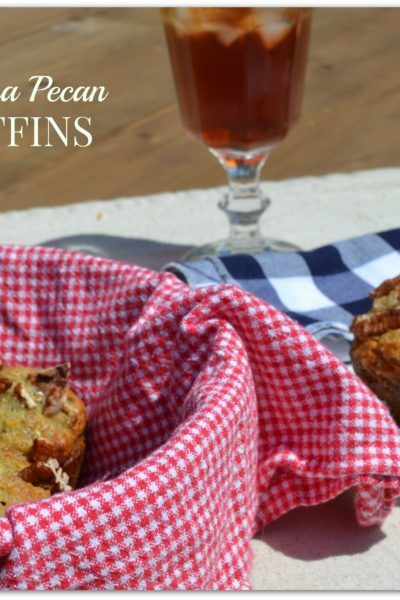 I love the transformation so much I’ve been clicking through your blog and enjoying everything! You have a new follower on Facebook. That’s a wonderful use of what looks to have been unusable space before. That looks like much more than just a porch now. It sure has come to be the most favorite room in the house! Beautiful! What a great job. I am jealous. You did an awesome job! 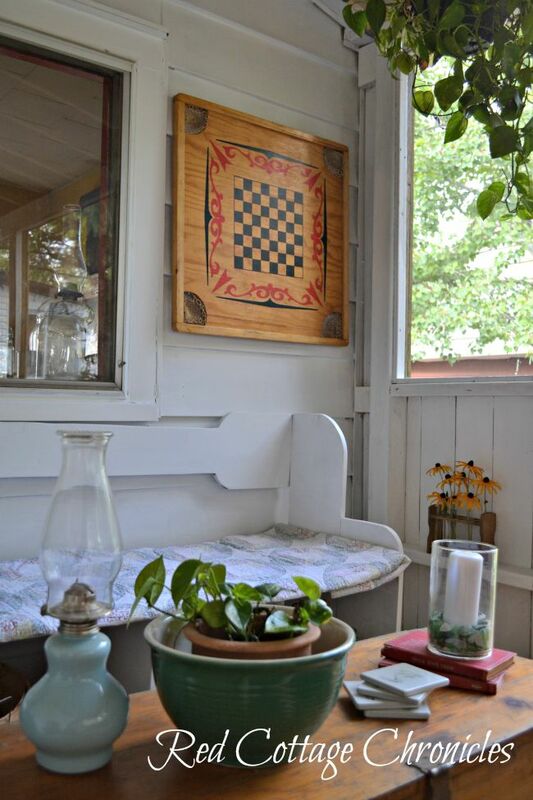 One of the things I miss about my childhood home was our glass porch. It was nice to sit out there and talk to my grandmother. Your porch look nice and cozy. Thank you Tiki! It is indeed a cozy spot but feels like your outdoors! Love you final result! And, you have my favorite flowers, Black-eyed Susans, in there as well. All that hard work really paid off and now you get to enjoy the fruits of your labor. Thanks Sandy! It was a fun project to work on. And, my garden is full of Black-Eyed Susans, so bright and cheerful! Stunning work! What a beautiful space to enjoy a book or just relax over coffee. I especially loved the floor.. it looks so purposeful! And the license plate– what a fabulous idea. Congrats on a job well done! What an awesome job and your photography is outstanding! Looks like you have a wonderful camera and maybe had a photography class? The photos are just stunning. Thanks so much Beth! I use a Nikon entry level 35 mm, but it works pretty well! I am working my way through a photography course from Shootfly! Really easy to follow and understand! I love your big reveal. That yellow phone is priceless. 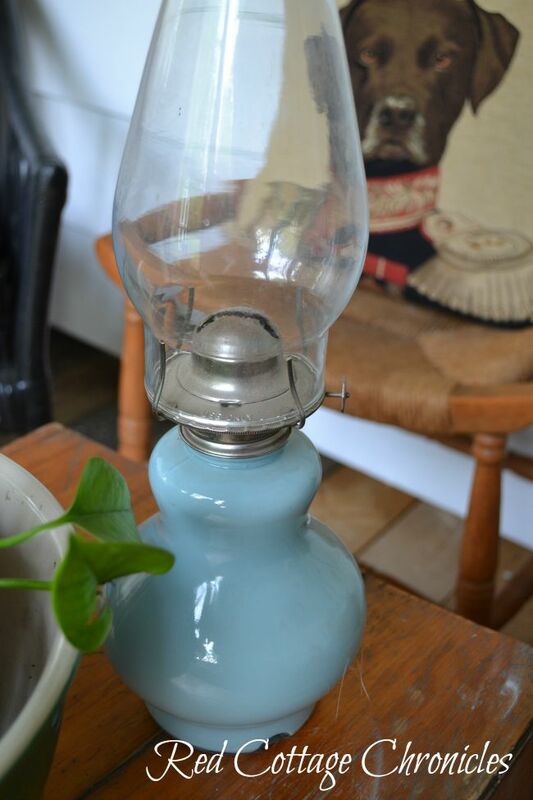 I also love the blue colour of the gas light. So pretty. I live that you have re-purposed items to store and organize other things. So lovely. Congrats! Wow! It looks awesome! You did such a great job! It’s nice to have a cozy place like that to relax in. Wow, what a change from the first picture you showed. Looks like it turned out great. You’re very creative. It’s nice to reuse/reclaim items that someone already has. Very creative. 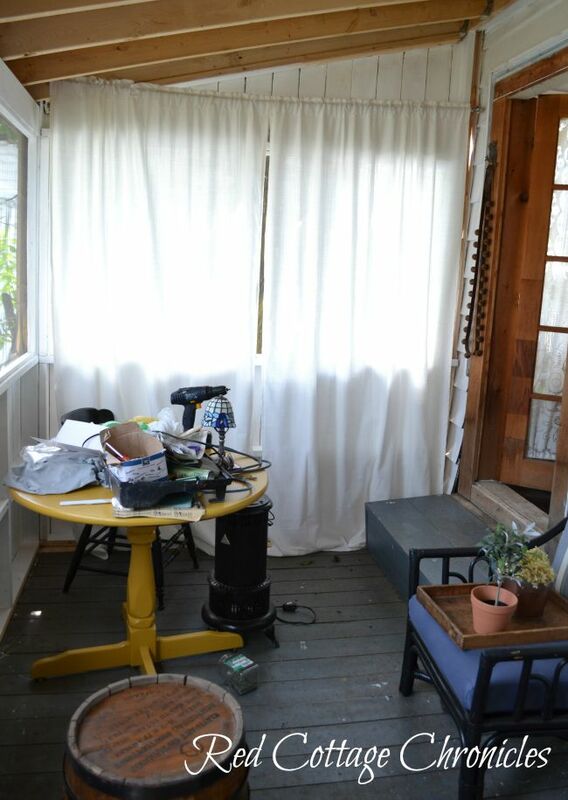 You did a great job fixing that porch to be something you want to spend a lot of time in. Makes me look forward to some of my diy projects that need to be done. I am in awe. You are so amazing. Thanks for sharing your work. I’ve always dreamed of living in a little cottage. Just looking at the pictures made me happy…I can only image how wonderful it would be to live in that cottage!! It looks great!! 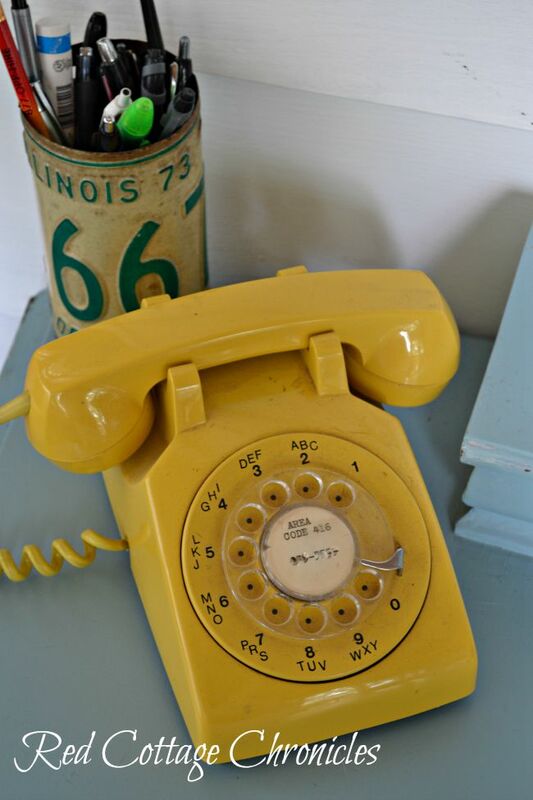 And I love that yellow telephone! What an awesome space! And some great photos, too. Oh my! What a sweet, sweet space! And you made it beautiful, comfy and homey. The pictures speak volumes. Just lovely! Aww! Thanks Brian! 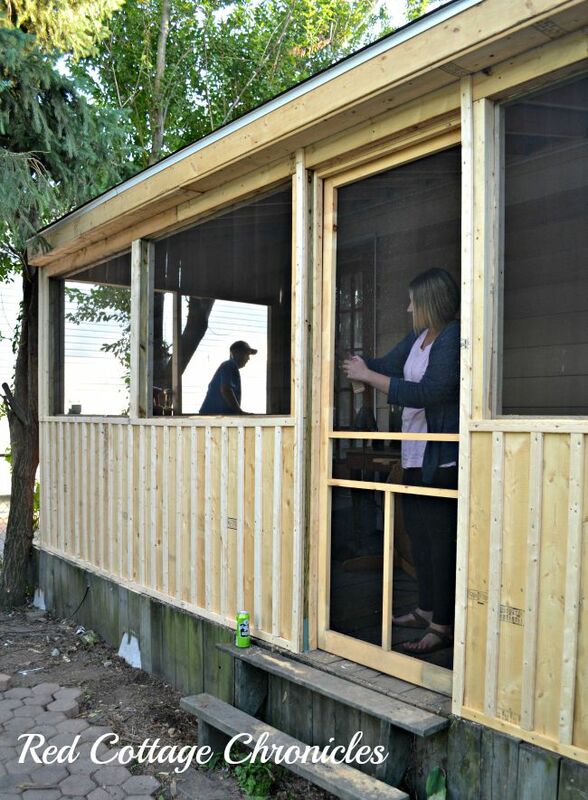 I am lucky to have a husband who likes to build things….and that we work really well together! 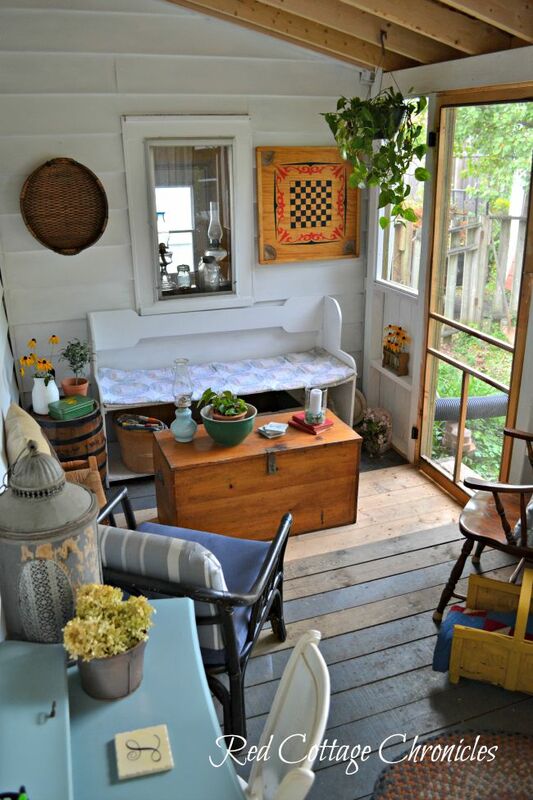 I love what you ended up doing with the screen porch! The re-build is very beautiful and I love the fun details you ended up using. I love the telephone and the dog details (the Boston Terrier is very cute!). Thank you Autumn! I never know what I am going to find at Leslie’s house! Would you believe she has one in almost ever colour?! This looks gorgeous! I love that you were able to use her old things and make them new for this room! Also, I am in love with that yellow table. 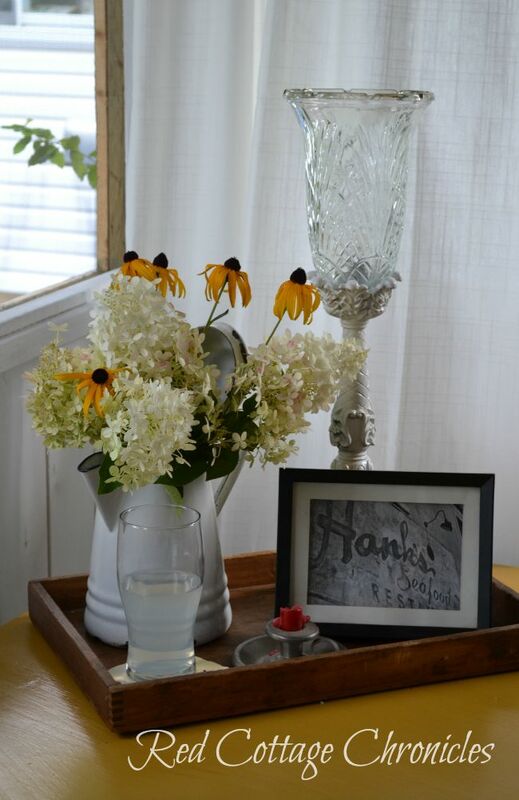 She certainly does have lots of stuff… love that old wine barrel turned side table… so cute! It is lovely! 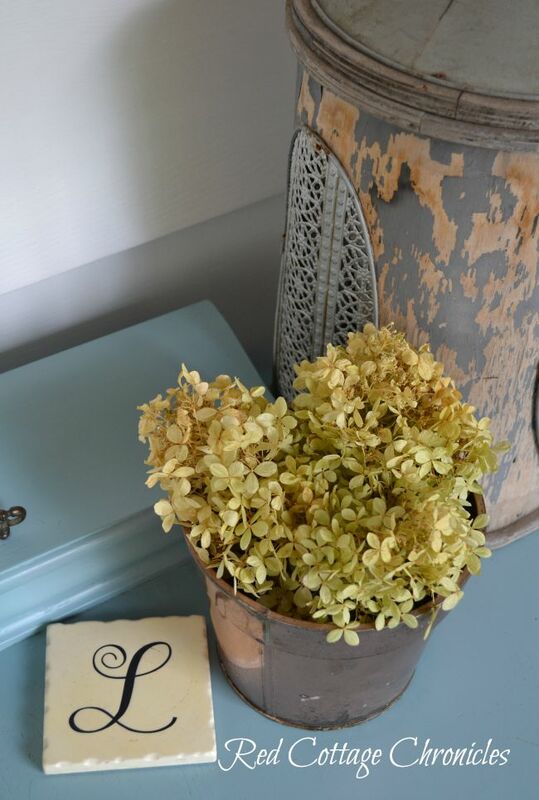 I adore all of the rustic and vintage details. I can tell you put a lot of thought into this project. Nice work! Thanks Amy! 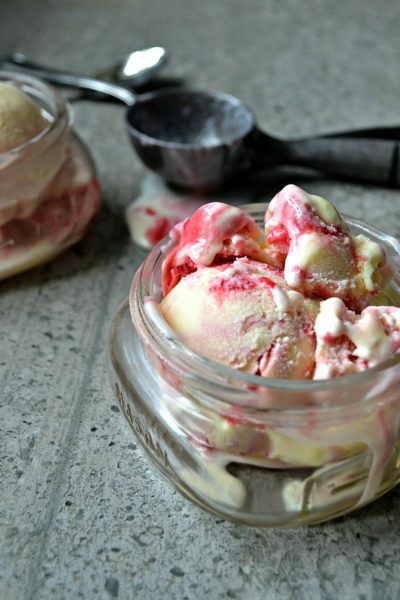 Leslie collection of vintage finds makes it a really fun process! Thank you Erin! I am so happy she decided to paint that table yellow! 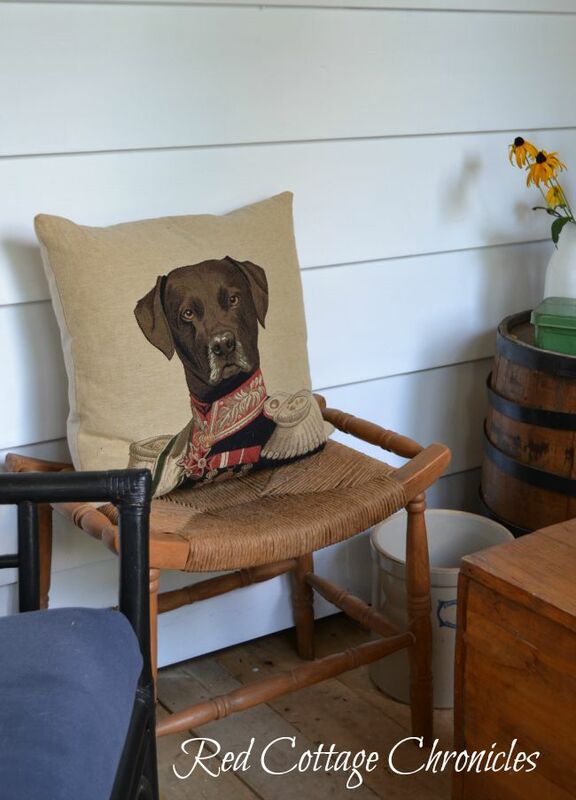 I love, love, love, love….did I mention LOVE your porch! 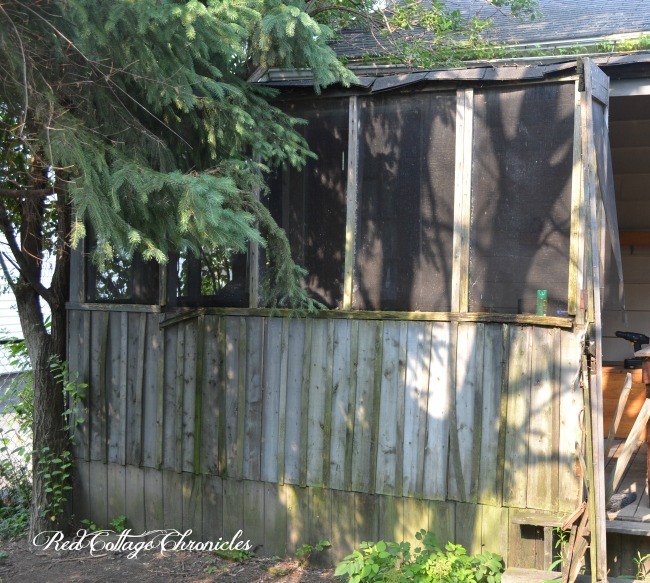 We have a victorian with a wrap-around, but I still crave a screen porch! OH, I’m having porch envy. I’ll have to show this to my husband – ours looks like your before picture!!!! Well done! One day, when I can find the perfect house, I want a porch like this. 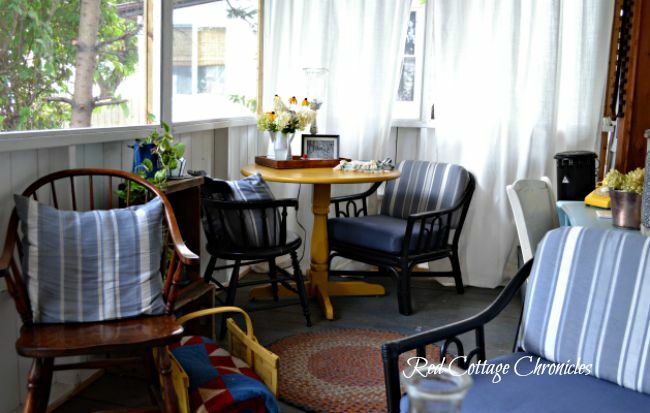 It’s so warm and welcoming, perfect place for a cozy afternoon with a good book and a pitcher of lemonade. What a great job! I love the use of the wine barrel for a table. Love it! I totally can see myself out there!!! Hope you enjoy it! What a beautiful screen porch! A little slice of heaven indeed! Thank you Ms Orange! That is a great way to describe it! This just looks so cute and cozy. I love the photos. Thanks for sharing! You did an excellent job! This should be in a magazine, very classy! Wow! Thanks Renee. You made my day! I love this! It’s so cute. I could set up a writing studio there. You did a great job. Thank you Kayla! A writing room would be a wonderful use of this space!